This remodeled beach home and Efficiency Apt. will become a favorite for your family vacations year after year. They are located in 'Old Town' Port Aransas within walking distance to beach, restaurants, shopping, fishing, boating and more. The CORAL COTTAGE is a 3 bedroom, 2 bath, with coastal decor that will sleep 8 people comfortably. 1 Bedroom/1 Bath Efficiency apt. (Boathouse) and is decorated with a nautical theme. 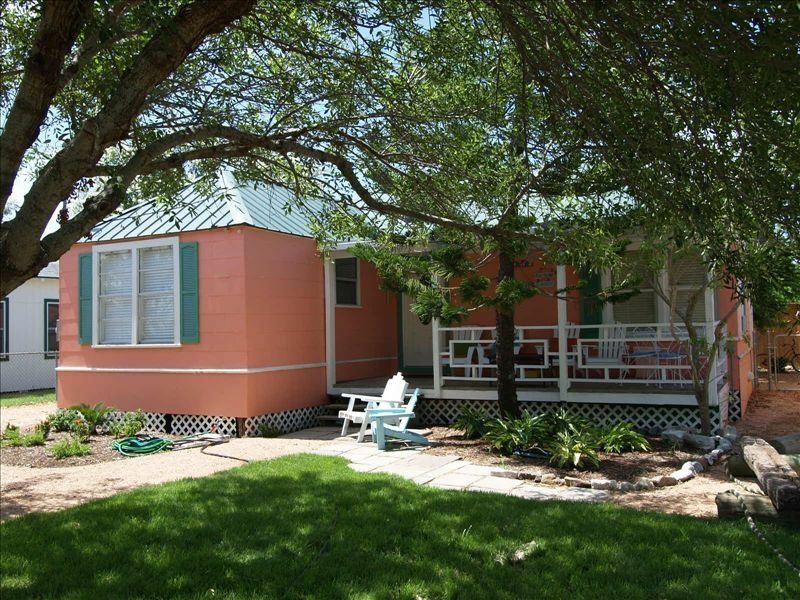 We love spending time at the 'Coral Cottage' and Boathouse in Port Aransas,Texas and find it to be quaint, charming and a very relaxing vacation beach house and apt. The property also has a fenced yard and outdoor shower with hot/cold water. Sit back and reflect on the day's adventure on this timeless front porch. Beautifully landscaped surroundings make it a cozy place to stay. The Coral Cottage kitchen has brand new modern stainless steel appliances and is fully stocked with dishware adding a tropical flare. The living room allows for additional sleeping arrangements on the sofa and chair pull outs. Ceiling fans and central air & heat with additional window units ensure you'll be comfortable after your warm day at the beach. Off street parking and walkways are crushed granite for added beauty and safety. Hope you will choose to stay at our Vacation Rental and take advantage of our Great Rates. THE BOATHOUSE REPLICATES THE SMALL BUT EFFICIENT LIVING QUARTERS OF A SHIP OR BOAT ---THE BOATHOUSE SLEEPS (2) ADULTS (DOUBLE BED) IN THE BEDROOM ON THE TOP FLOOR. THE LOWER FLOOR WHICH HOUSES THE GALLEY AND BATHROOM ALSO HAS THE MATE QUARTER/BERTH WHICH WILL SLEEP ONE, PERFECT FOR AN OLDER CHILD OR TEENAGER (BRING YOUR SLEEPING BAG AND PILLOWS). THIS APT. WILL GIVE YOUR GROUP ADDITIONAL SLEEPING SPACE AND WILL BE PERFECT FOR COUPLES OR INDIVIDUALES THAT WISH TO HAVE PRIVACY(THEIR OWN LITTLE HIDE-A-WAY). THIS UNIQUE AND FUN EXPENIENCE WILL KEEP YOU COMMING BACK OVER AND OVER AGAIN. THE BOATHOUSE ALSO HAS A SCREENED-IN- PORCH WITH BISTRO TABLE AND CHAIRS. REFRIGERATOR/FREEZER, COFFEE MAKER & TOASTER--SMALL MINI BATHROOM WITH SHOWER---ALSO HAS DIRECT TV. HOPE YOU HAVE A TERRIFIC VACATION !!! I grew up in Corpus Christi, Texas. I loved spending time on the nearby beaches gazing at the beautiful sunsets over the water and just digging my toes in the wet sand. Much of my time growing up was spent in acivities that took place near/or on the water. After moving to Austin, Texas I still longed to be close to the water/beach. Buying this unique vacation cottage has given our extra large family a wonderful opporatunity to continue to enjoy many more happy times in Port Aransas. My husband is an avid fisherman as are many of our children and grandchildren. He plans fishing trips to Port Aransas quite often. He grew up in Houston and he and his family loved to come there for fishing vacations. He still remembers traveling on the wooden plank road that came into Port Aransas from Aransas Pass. Needless to say, he has been coming there for a very long time. It holds a special place in our heart and I feel if you will come to Port Aransas and stay at the 'Coral Cottage' and also take advantage of using the Boathouse you to will also be able to share that same feeling. One of the main reasons we bought in Port Aransas, Texas is that we love being near the water and we love Port Aransas. Our family has spent many wonderful vacations there and feel that there is no place like it. Great fun for people of all ages. Our grown children and their families have strong ties and fond memories of beach vacations with their own families and friends. We all look farward to many more happy times in that SPECIAL,WONDERFUL AND FUN TOWN. Charming-Quaint-Large shade trees-Relaxing setting-Fenced Yard-Outdoor Shower-Single Story-Outdoor tables and chairs.tropical decor,Close-In Location('Old Town',Very Convenient and Popular Part of Port Aransas),Large Front Porch,Crushed Granite Walkways,Walk to Beach,Restaurants and Shopping,King and queen beds,'Direct TV',Remodeled,Up-to-date Appliances,Washer/Dryer,Vaulted ceiling in living area,Efficiency Apartment. Outdoor shower,fenced backyard. Close to everything, walk or ride your bike. Thank you Madelyn! We had a great time at our rental for the weekend. There were 3 couples & it was perfect. Plenty of room for us. Great fenced in back yard for our little dog. Nice sitting area in the back to enjoy the evening just hanging out. The owner is prompt on returning calls/texts. Thanks again!!! We had a great trip to Port Aransas and this property was part of the reason. Exactly as advertised, very clean and ready for our arrival. Everything worked, no surprises and the property owner kept in contact prior to our arrival. We will be back!! Perfect place for family and friends to stay with plenty of room! Nice yard for our pups! Madelyn is extremely accommodating and the best hostess ❤️. We will definitely return! Great Location and super comfortable! Awesome cozy house and the location is amazing. Well taken care of and communication and settling in was a breeze. Have stayed here many times and will definitely be back! Ideal for a family gathering. Walking distance to everywhere. Tucked in with shaded parking. We cooked our own breakfasts and ate out the rest of the time. Three showers and three outdoor gathering areas. The boat house was adorable - a place apart from the main house. The only thing I would improve on was the indoor dining table. There really was not a good table to sit our group of six down to eat at the same time. Other than that, it was pretty perfect. The house was really nice, just the right amount of space that we needed. The location was perfect, close to everything. Madelyn, the owner of the house, was really nice, she even allowed us to check in early. The only issue had to do with maintenance and cleaningness. The house wasn't as clean as it should have been. There was white dog hair on the floor, the towels didnt smell fresh, couches had stains on them, the window unit air condition in one of the bedrooms had mold, and one of the beds had little spiders on them. Had to call cleaning lady to come take care of that. One of the shower heads had heavy calcium build up (it was a greenish blue color). The two shower curtains were really dirty, sheets in the rooms were dingy with stains on them. And there were roaches and ants in the house. Even a big roach on the twin size bed, guest decided to sleep on the couch. There was also a bar stool chair that was broken, and one of the BBQ pit legs was broken and so was the lid, unable to open it all the way, or close it properly. Thank you for taking the time to write the review. We will certainly take a look at the items you noted. Once you made us aware of the spiders, our property manager made a trip over to the house to see what was going on. At that time she didn't see evidence of spiders, but went ahead and sprayed anyway. We didn't have any prior complaints or any complaints of spiders since your rental period.We do have the house exterminated and because of the moist climate of the Coast roaches outdoors are a problem..they love the Palm Trees. From time to time they make their way indoors, i do apologize for any inconvenience this may have caused. Pet fee is non-refundable $100.00 Security/Damage Refundable Deposit Refund of deposit will be based on condition the property is left in. We accept checks, credit & debit cards, if you would like to call us directly at (512) 787-3797 to process your payment.